Xiaomi will launch a few new smartphones on May 31 to celebrate the 8th Anniversary, and as per the sources, the company is going to launch Mi 8, Mi 8 SE and the Mi 6S. Also, the Mi Band 3 and the MIUI 10 will be announced at the same event. We already know that the Xiaomi Mi 8 is going to be a high-end flagship, featuring the Snapdragon 845 chipset. 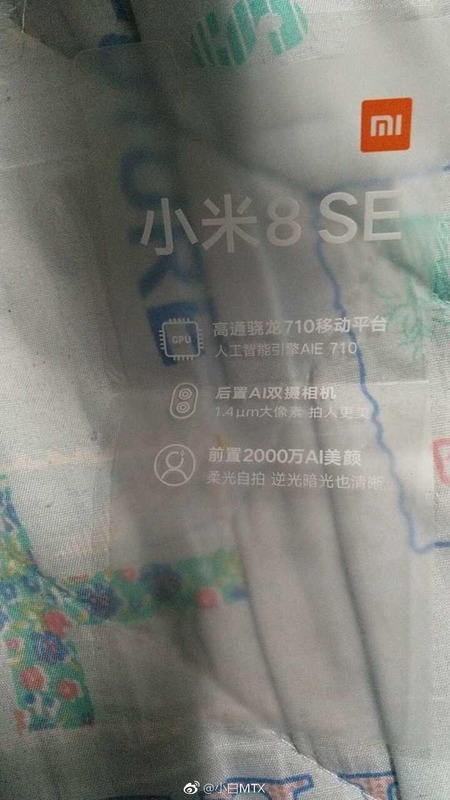 Today, a couple of specifications of the Xiaomi Mi 8 SE were revealed by a user on Weibo, and it looks like the Mi 8 SE is going to be the very first smartphone to launch with the Qualcomm Snapdragon 710 chipset. The Snapdragon 710 launched just a few days back, and it is an impressive mid-range processor built with the 10nm process. For comparison, the chipset sits just below the Snapdragon 845 and 835 regarding the performance. It also has an AI Engine which drastically improves the overall performance of the device. The Xiaomi Mi 8 SE, with the Snapdragon 710, is surely going to be the best mid-range smartphone when it launches. The phone has a dual rear camera setup with AI features and 1.4μm pixel size. On the front, there is a 20MP camera which too, has some AI features like Portrait Mode, Face Unlock, etc. Ishan Agarwal, a Twitter user, shared the details about storage and color options of the device. The Mi 8 SE is coming with 6GB RAM and 64 GB internal storage. The color options are Gray, Blue, Gold & Red. We are yet to see the design of Xiaomi Mi 8 SE, but if this new leak is legit, then the upcoming Xiaomi’s launch event is going to be interesting.